Quench Your Orange Crush with This Solid-State Amp Head! Your wait for a solid-state Orange amp head is over. 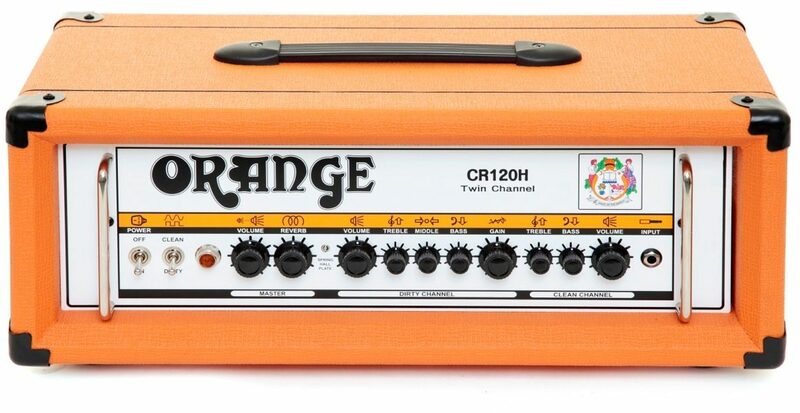 Orange took its time tweaking its design for the CR120H Crush, and ended up with a sound worthy of the Orange name. This two-channel treat is based on Orange's celebrated Rockerverb series -- projecting a warm and clear clean tone, and a layered distortion that breaks up nicely when turned up. In addition to a transparent effects loop, your CR120H Crush comes with onboard digital reverb with plate, hall, or spring settings. It's also dressed in Orange's familiar design and color. Your CR120H Crush sports Orange's recognizable woven speaker grill, the Orange signature, and textural basket weave Tolex. On the inside you get reliable circuitry that pumps out that decades-old sought-after Orange sound -- and this time, it's solid state. Orange spent considerable time working with designs to make a solid-state amplifier that stands up strongly to their infamous tube sound spanning over half a century, so you can count on consistently hearing a superior tone when you plug in and play. The front panel of your CR120H head hosts volume, treble, middle, bass, and gain knobs for your distorted channel, and volume, treble, bass, and gain knobs for your clean channel. Your master volume and reverb knobs sit right next to each other to give you easy access to your onboard reverb and master output signal level. Footswitch inputs for your reverb and channel settings make switching seamless and easy. The solid-state design of your CR120H harnesses stages of gain that break up your signal for each of your channels. Your signal going through your clean channel has two stages of gain, and your dirty channel provides four stages of gain. When you push your signal to a hotter level, a nice and crisp signal breakup comes through. Play with your gain settings to see what particular gain level suits your personal sonic signature. - Controls: Clean Channel: Volume, Bass and Treble. Dirty Channel: Volume, Bass, Middle, Treble and Gain. Global: Volume and Reverb. The high-power Orange CR120H Crush Guitar Amplifier Head heralds a dawn for Orange Amplifiers. These mark Orange's first foray into the world of high-power, solid-state amplifiers. The reason it has taken so long? Orange Amplifiers wasn't happy with the sound -- that is, until now. Orange have spent years researching, developing and testing a solid-state amplifier which they are truly proud of. The Orange design team felt it was important to keep these amplifiers simple and not bombard the player with hundreds of on-board features. The result is an analog, solid-state, two channel (dirty and clean) amplifier based on the prestigious Rockerverb range. The dirty channel use a circuit based on four stages of gain and a three band EQ which provide the player with a wide pallet of overdriven and distorted sounds. The clean channel is based on a two stage, two band EQ design, that gives the player a clean but warm sound which when cranked begins to break up, just like a Rockerverb! 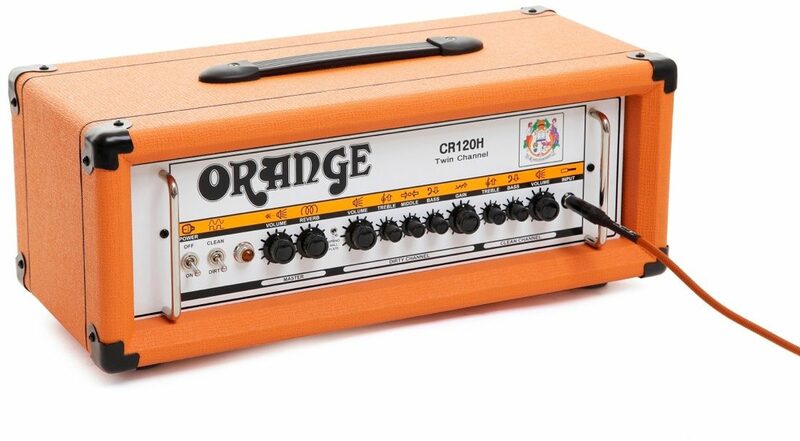 Orange has also given the CR120H Crush a transparent effects loop, allowing you to plug in your favorite pedals to open the amplifier up to a wide variety of situations and playing styles. Finally, the amplifier contains an built-in digital reverb, providing the player with a natural sounding spring, hall or plate reverb. Like with all Orange amplifiers, the look had to be right. The Crush exhibit the same features as their valve-based brothers which includes Orange basket-weave Tolex, woven speaker grille, beading, hieroglyphs and of course the Orange signature picture frame edging. The Crush CR120H packs a 120 Watts into a head with the classic Orange look. The Crush CR120H has been designed to look and sound the part, be it in a rehearsal, living room or on the stage. "Truly a monster of an amp!!!" Overall: This amp has completely and utterly blown me away. I play mostly heavy metal and this amp just rips. The dirty channel has tons of gain, and it's nice, thick, and chunky. But it's a sound all it's own. Playing leads on this amp is just awe inspiring. The note separation is so perfect, great control of all my notes, even when I'm playing super fast speed runs, and sweep arpeggios. The sound never gets muddy. It's stays crisp, and every note is clear. The clean channel is just beautiful. The level of warmth you get out of the clean channel is just perfect. It actually gave me goose bumps. This amp just sings in every way. I've owned a lot of amps, from a dual rectifier, to a mid 90's peavy 5150. And this amp is truly right there with those amps. And the part I like most is while it's super heavy, it's still will make your sound unique, which I personally think is awesome. Style of Music: I play anything from country to hip hop. But my love has always been heavy metal. It's what inspires me. It gets me groovin. "Best solid state amp I've used!" Overall: I was looking for an amp for live performances and I came across this amp. It has a very nice warm tone that you don't typically hear with solid state heads. Doesn't break up at high volumes and just pumping the volume halfway this thing is window shattering loud. Great amp for the money if you don't have it to invest in a good tube amp. This thing is a killer and worth every penny!